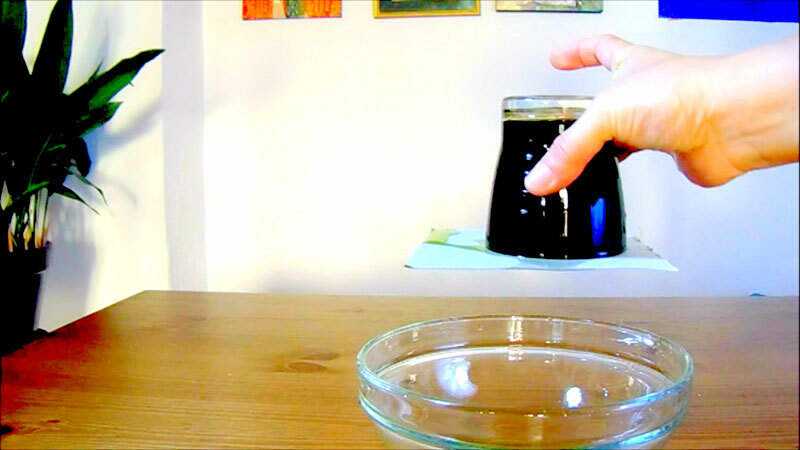 (Glass Or Cup) Upside Down Water Experiment : An Amazing Science Trick! 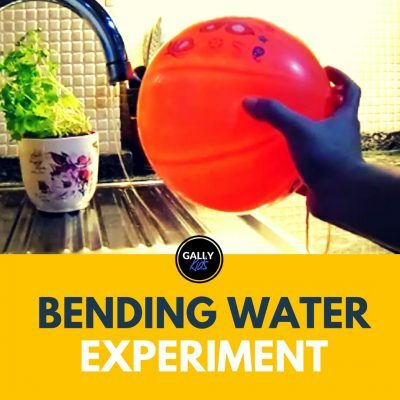 This upside down water experiment is one of these amazing Science activity that my son loves. Who wouldn’t? It defies common sense, doesn’t it? 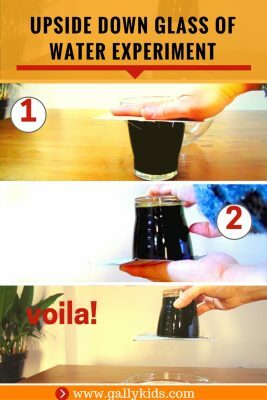 How come the water doesn’t flow out of the glass or cup? What in the name of Thor is happening here? Let’s find out. So first thing we did was to pour water into the glass. Well, actually, the first thing we did was to add color to the water. You don’t have to do this. But it looks better this way. So here it is. 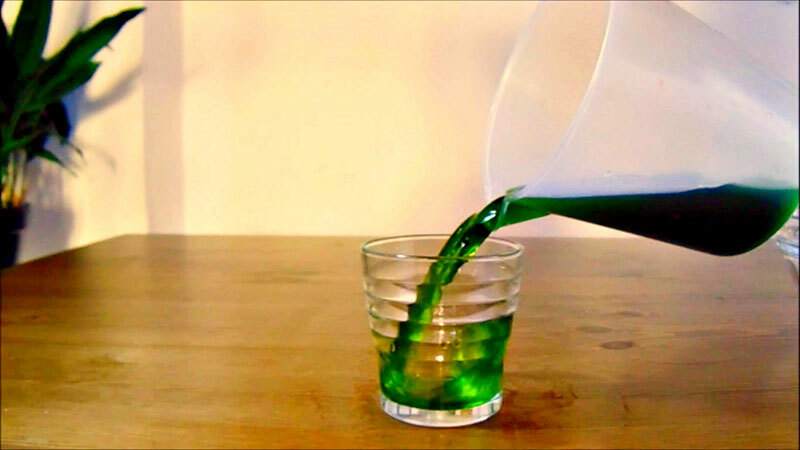 Us pouring green water into the clear glass. We fill it to the brim. Once all these is set up, we put the thick card on top of the glass. And got ready to tip the glass upside down — this mainly meant making sure that the bowl was ready to catch the green water should this one fail. Since it’s now all ready, it’s time to flip the glass upside down. This bit is easy because we’ve still got our hands on it. You just have to trust yourself (and Science) to make this thing work. We could even turn it up and down and up and down without the water pouring out. 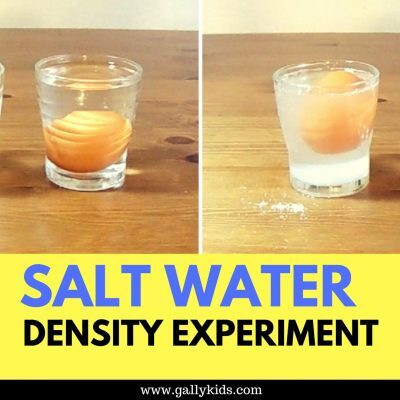 Look at this kids happy face with this amazing science experiment. 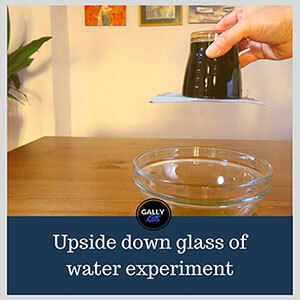 So there you have it, the upside down cup water experiment. 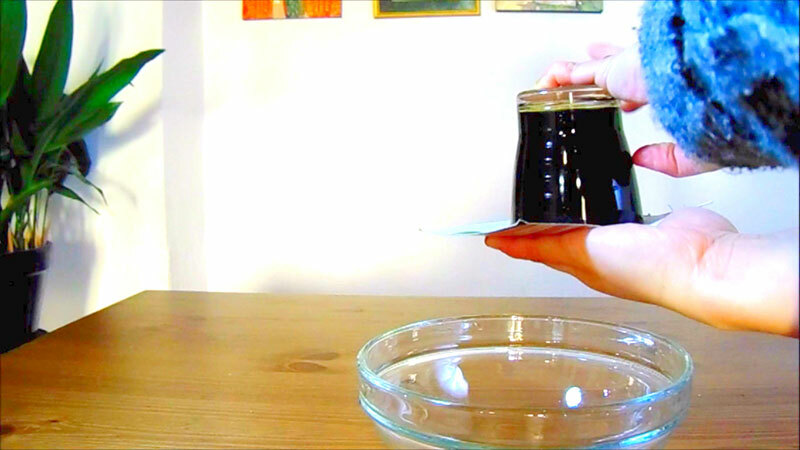 If you want to do this amazing Science trick in your house (and you totally should! ), here’s the easy to follow instructions. First, pour water into the glass. Fill it as much as you can. Next, get the bowl ready. Just in case the experiment doesn’t work the first time. Then, put the card on top of the glass. Put your hand on it and flip. This can be a bit daunting at first especially if you don’t have that bowl underneath. But just flip it and trust yourself. You will see a little bit of water seep out of the glass. Don’t let this scare you. Press your hand firmly and then…. And voila.. Water defying gravity. You can even flip it up and down and the card is still stuck to the glass. 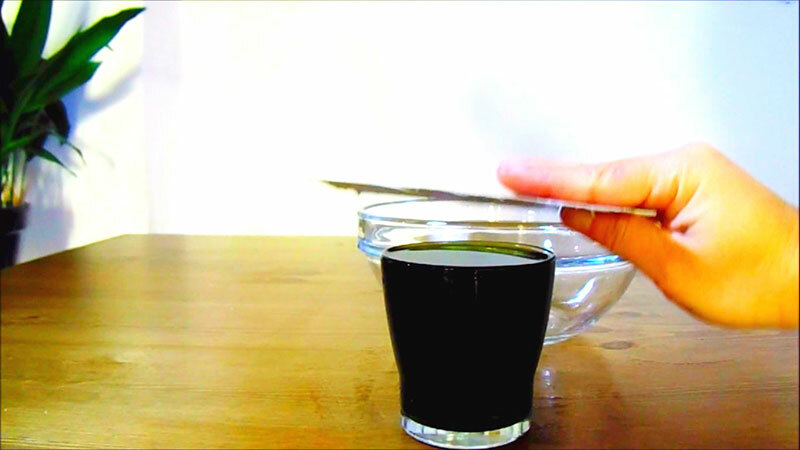 This experiment from Physics Central gives a very detailed explanation of why this works. Here’s my summary of it. If you look closely at the glass, there is a little bit of space at the top. Because you quickly flipped the glass upside down, there was not enough time for the air molecules to go in into that space. 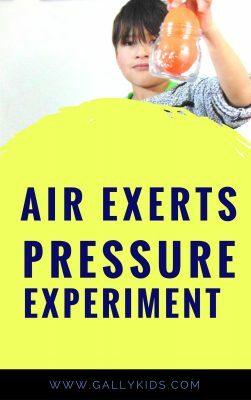 This means that there’s less air molecules (therefore less air pressure) in the glass compared to the outside environment. Since the outside environment has higher air pressure, it’s stronger and is pushing that card to the glass/cup, making it stick to it. 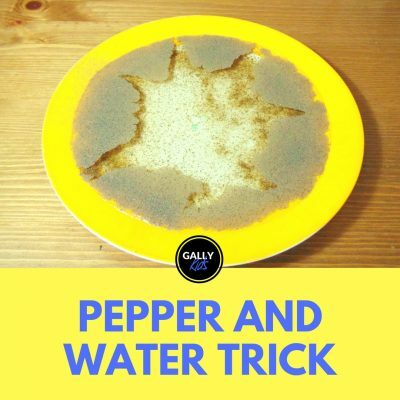 At the same time, water has surface tension and adhesion. Surface tension makes water want to stick together (since they’re in that glass, their molecules want to stay together and not want to separate). Adhesion is water’s characteristics to want to stick to materials. And there’s the card to stick to. So basically, the water molecules don’t want to leave the glass and it’s also sticking to the card which is being pushed by the outside air pressure. So if you consider these two things together working harmoniously with each other, you get upside down glass of water. 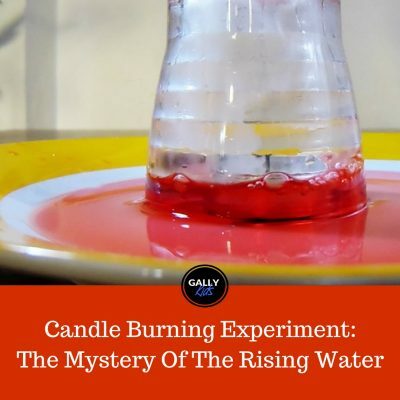 You can also watch this experiment in video below. It’s from your Gally Kids Youtube Channel. 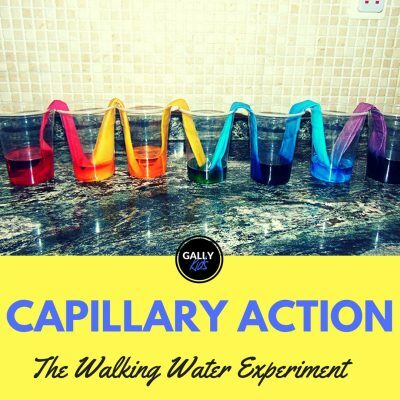 Just a note – we regularly add cool science experiments, toy reviews and craft tutorials over there, so don’t forget to subscribe to get notified!